The Dragon*Con parade was definitely the highlight of our family’s weekend. Whether you are a participant or a spectator, it’s a fun way to get into the spirit of the event. Photo: Flickr user TheOtter via CC. 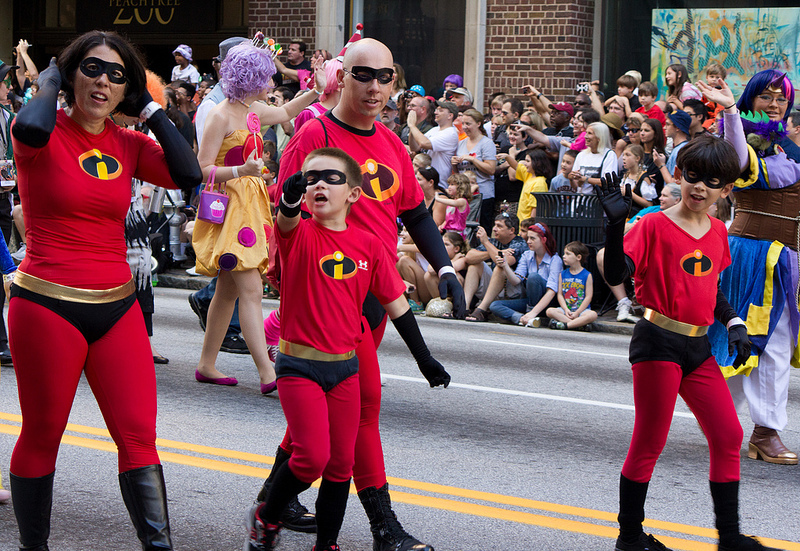 Not only did I don a Spandex costume and convince my husband and sons to do the same, but we chose to walk down Peachtree Street in downtown Atlanta in front of 40,000 total strangers. And it was phenomenal! I told you I was going big for my first con. We marched in the Dragon*Con parade, which is one of the highlights of the con and is one of the most family-friendly events the entire weekend. It takes place on the Saturday morning of Dragon*Con and is open to the public for viewing. This parade is so outstanding — very grassroots, with volunteers working diligently to make this a smooth experience for those of us marching as well as for the spectators. There are no politicians campaigning, no commercial sponsorships, and if you pass out items, it has to be for non-commercial entities, such as stickers and candy. This whole cosplay thing is new to me. Or is it? After all, I’ve always had fun making Halloween costumes for my sons (final product here), and my husband and I have been involved in Civil War reenacting since 1997. Also, I had fun coming up with a runner-friendly Mulan costume earlier this year. Okay, so maybe cosplay isn’t really new to me. I just never called it that. I had thought about costumes based on The Incredibles several months before the thought of attending Dragon*Con had crossed my mind. In fact, if you check out the last paragraph of the post about my Mulan costume, the Mrs. Incredible idea had already been brewing. Think about how Edna had made Mrs. Incredible’s super suit, “Your suit can stretch as far as you can without injuring yourself, and still retain its shape. Virtually indestructible, yet it breathes like Egyptian cotton.” So I had planned to assemble this costume for running the 2013 Disney Princess Half Marathon this coming February. I had been searching online for red running clothing for several months. Confirming that I would attend Dragon*Con prompted me to hit “Add to Cart” on the Amazon website just a little sooner. Most of what we were wearing were either items on hand already, or else purchased and assembled. Red leggings by Gymboree for the boys. Red “Heat Gear” shirts by Under Armour for the boys. *My husband is wearing a cotton The Incredibles t-shirt in the picture above. The rest is just basic assembly. This wasn’t nearly as ambitious as some of the more creative costumes we saw that weekend, which a simple Google search will yield. Honestly…this was a very easy costume to assemble. The characters are from an eight-year-old film. So why were we stopped every two seconds to be photographed as a family? It was surreal and completely unexpected. We were a family who chose to cosplay together. Since there aren’t many children at Dragcon*Con, one can imagine that a family dressed together was even more rare. I didn’t think that part through, though. As we were walking towards the Kaleidoscope track room to meet GeekMom Mandy’s family and pick up our parade wristbands, we were stopped several times to take pictures. We ended up arriving at the track room a couple minutes late. I would like to apologize to the first dozen or so people who took pictures of us. We just sorta stood there at first. It was not till after the parade that we agreed to pose like our respective characters. Do You Want to March in the Dragon*Con Parade? If you’ve ever wondered about marching in the parade, it’s amazingly easy and no additional charge to those who have Dragon*Con memberships that include Saturday. Dragon*Con veteran GeekMom Mandy told me to go to the Dragon*Con parade website which had instructions for inputting your intent into a Yahoo database in the D*C Parade Yahoo group. All I had to was submit a POC name, email address, and the number of people marching in my group. Nothing further is required. Those who are registered can participate in the group to ask and answer questions. One week before the parade, the director will send out the group assignments. You need to make your intent known relatively early. The director works with a numerical cap, so as soon as he hits it he will close the registration. This year registration closed on August 14th, so if you know you’re going to do it, take a moment and enter your intent in the database. The parade itself is very laid back. The only thing that the group is strict about is being signed up ahead of time (this year there was a cap of 3500 participants) and having any weapons peace-bonded prior to marching. One cannot simply walk in at the last minute and march in the parade. Participants are given Tyvek wristbands and cannot march without them. The group that you’re assigned to is really just guidance. If the director assigns you to the Heroes and Villains group, and you want to march with Kaleidoscope instead, that’s perfectly fine. No worries! We staged for the parade at Woodruff Park in downtown Atlanta, just a few blocks south of the five Dragon*Con host hotels. Our group was staged right next to where the VIP guests were staging, so we ended up standing right next to Lou Ferrigno while waiting. 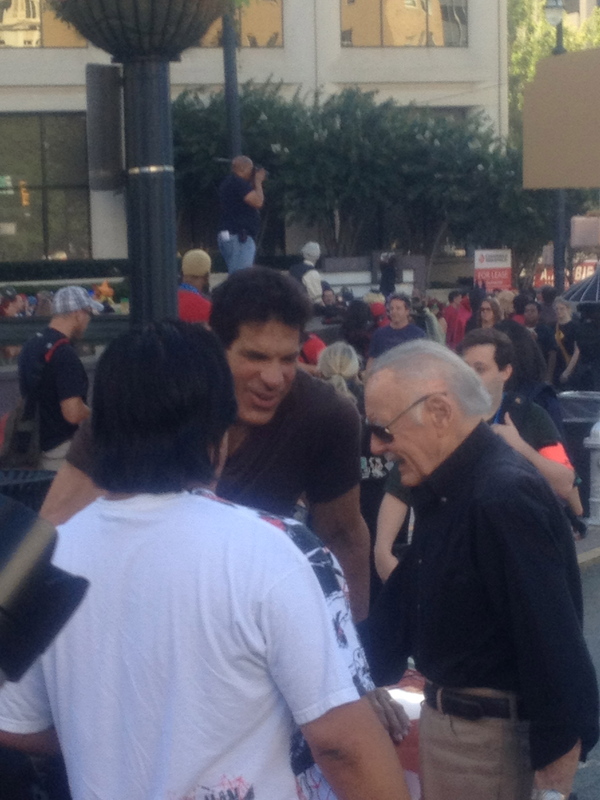 The Grand Marshall, the amazing Stan Lee, walked up to him and struck up a chat. A woman with a bullhorn, the great (and LOUD) Leigh Bennett-Conner, would announce which order the groups were to step off, and our group was the 8th (out of over 40) to proceed. The parade route isn’t very long, about 2/3 of a mile. The Tolkien group ahead of us had a LARP group which stopped to bludgeon each other about every 400 feet or so. This pace helped make the parade easy for the kids and also helped with the warm temperatures. Our kids had a great time posing for the 40,000+ spectators. The parade director, Jan “JP” Price, did a great job this year coordinating with the Atlanta Police, the Dragon*Con staff, a local Boy Scout troop who handed out water at the end of the route, as well as all of us parade participants. Did you watch the Dragon*Con parade? Have you ever marched in the parade?